TWICKENHAM, Sunday - England wing Jonny May said it was “awesome and very special” scoring three tries at Twickenham as he did in the 44-8 mauling of France in their Six Nations clash on Sunday. The 28-year-old -- whose three tries came in the first-half of a one-sided contest taking his Test tally to 22 -- said he and his team-mates had wanted to improve on their performance from the 32-20 defeat of champions Ireland last weekend. “Trying to raise the bar after last week was the challenge, but we came out and definitely played some good rugby today,” he told ITV. “The brand of rugby we want to play, we want to put teams under pressure. “I’m just doing my job, we are all working hard and putting some good performances together. “We have learnt a lot and worked incredibly hard, and it’s paid off in the end. 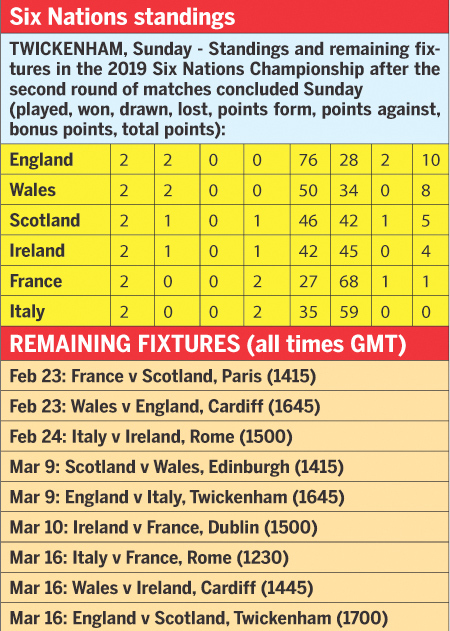 England -- who are bidding for their second Grand Slam under Eddie Jones -- head to a potential title decider with Wales in Cardiff on February 23 with Warren Gatland’s side also having won their opening two games.